Definition at line 17 of file image.h. Human-readable comment for this set. Definition at line 23 of file image.h. Definition at line 22 of file image.h. Definition at line 24 of file image.h. Faceset to use when an image is not found in this faceset, index in facesets. Definition at line 20 of file image.h. Referenced by check_faceset_fallback(), and read_client_images(). Definition at line 19 of file image.h. 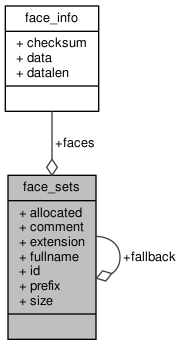 Faceset short name, used in pictures names (base, clsc). Definition at line 18 of file image.h. Definition at line 21 of file image.h.